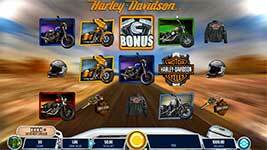 Review of: Harley Davidson Freedom Tour Online Slot by IGT Free at Slotorama! Jump on your bike and get ready for a victory lap in Harley Davidson Freedom Tour slot by IGT! Dream about hitting the open road when you spin the 5-reels and 30-paylines. Aside from the games base rewards, there are a whole host of impressive and rewarding bonus features. Earn huge bonus prizes with Rumbling Wilds, Level Up Plus feature, Road to Riches bonus and Free Ride Free Spins. Experience the wide open road to riches in Harley-Davidson Freedom Tour! Rumbling Wilds Feature – The Rumbling Wilds feature can be triggered on any base game reel outcome that does not contain a Bonus symbol on the first reel. When the Rumbling wilds feature is triggered, 1 to 4 symbols, except for Wild or Bonus symbols, are randomly chosen. The Harley Davidson semi then drives by shaking all symbols on the screen and turning the chosen symbols wild. Level Up Plus Feature – The Level Up Plus feature unlocks new bonus games that permanently increase your payback. Feel the rev of the engine as you unlock up to 5 new slices on the Road to Riches Bonus wheel and trigger exciting new features. Earn 1 mile from each bonus scatter symbol that lands anywhere on the reels during the base game. Every 10 miles moves your Harley one stop on the map. Road to Riches Bonus – Trigger the Road to Riches Bonus in the base game when three bonus scatter symbols appear anywhere on reels 1, 3, and 5. Wins awarded in the Road to Riches Bonus are multiplied by the coin value on the reel spins that triggered the bonus. Free Ride Free Spins Bonus – Three free spins are awarded for this bonus. During the first spin, all instances of 1 randomly chosen symbol become wild. During the second free spins, all instances of 1 new symbol, in addition to the symbol selected in the first two spins, become wild. During the third free spin, all instances of 1 new symbol, in addition to the symbols selected in the first two spins, become wild. Showroom Bonus – Triggering the Showroom Bonus awards three picks and the multiplier is set to 1. Pick a box to reveal an award value, +1 pick / +1x prize, or a +1 pick/50 prize. RPM Multiplier Slice – When the Road to Riches wheel lands on this slice a tachometer appears. Every time the tachometer revs the multiplier increases. The tachometer will rev a random number of times rewarding a multiplier from 2x, 3x, 4x or 5x. This multiplier is then applied to an additional spin on the initial Road to Riches Bonus Wheel with any unlocked slices removed.